Designing in the context of health and wellbeing has always been an interest of mine. Doing my project with the DHW Lab was a valuable design experience for me. Especially being able to design in the field of dementia. Having lost my family member to dementia made this project a very emotional one for me and it had acted as a motivational push for me. The design process was a challenge as usual. One side of me wanting to jump to conclusions and the other side knowing there is more possibilities in it. The feedback I got from DHW Lab team and my lecturers helped me push on, because they also knew there could be more done. When I decided to just let go of that final product image in my head, it was the scariest decision I made in a long time. My previous design which I called it to be final had so many areas that just didn’t seem right aesthetically and functionally, such as adjustable aluminium body with a wooden handle. The proportion of it also was disturbingly unsatisfying. Accepting that, and taking on board the feedback from DHW Lab crew required so much courage but I never regretted that decision. I gained trust in the design process and have become so sure of the “fail often and fast so you can succeed sooner” (-Tom Kelly). I learnt that there is only a rough road to the design process but that makes it even more rewarding at the end. I believe the result of my concentrated effort was rewarding. 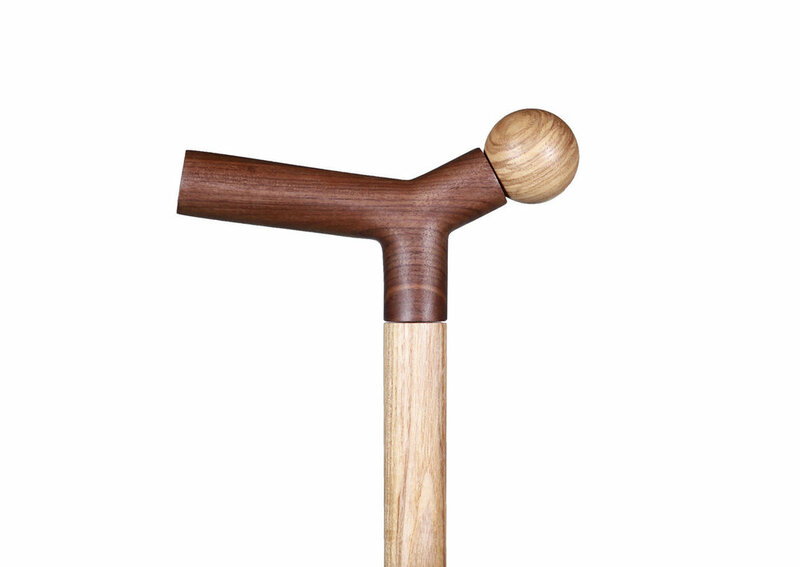 I used academic research on dementia to inform my dual purpose walking cane design, which allowed me to produce a product that considers many of the complexities associated with dementia. The making process was rough, my plan didn’t go as I expected, I was denied access to machines such as CNC. Therefore my walking cane was 100% handmade. From the hand-making process I learnt so much in achieving a high quality, detail focused process. It was hard but worth it. For further improvement, it would make sense to embed several more magnets on the wooden ball so that picking up process with the stick (with magnet also embedded) is much easier for the dementia patients. This would be necessary as for some patients it was distressing for them when they cannot pick it up immediately. For further improvements in my next project (graduation project) I will get on with the design process, especially prototyping widely throughout the whole project. There is NO end to design! Designing with the DHW Lab was so valuable for my learnings and it was amazing to be designing in the context of health and wellbeing, which I always wanted to attempt. Thank you to the DHW Lab crew and my lecturers who pushed me on, thanks to my Dementia design team mates/friends/family for the moral support. Last but not least, a huge thank-you to my granny who made this project more meaningful to me. Miss you heaps.